Comments: On a deadly but mineral-rich distant moon called Pandora, ex-Marine Jake Sully is torn between duty and honor when he finds himself caught between the heavily armed forces of Earth's most powerful star-faring consortium and an exotic, noble alien race whose very existence is threatened by the human invaders. Bio: Along with his wife, Mo'at, Eytukan is responsible for the safety and well being of the Omaticaya clan. He oversees the training of all warriors and hunters and is a key figure in many Na'vi ceremonies and rituals. He is the father of Neytiri. 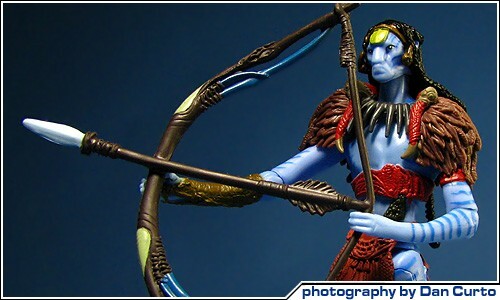 Note: This figure of Eytukan is based on the alien character played by Wes Studi.Comment: For more on the subject, see Army vs. Indians in Avatar and Evoking Natives in Avatar. I didn't see anything in the character that made him much different from any of the noble/wise "Chief" characters I've seen in different Western-related projects. But I guess it is good that they chose a Native actor to play what I consider to be one of the two most strongly Native-like characters in Avatar. I'll just say Wes Studi probably thinks it's a good thing that Wes Studi got a paycheck. Like Michael Caine said of Jaws: The Revenge. "It was a horrible film, but it bought a lovely house." It sure raises his profile, too, and will open more doors for him. The character was OK. But just not great like the one in "The Only Good Indian".